These black natural latex gloves are perfect for use in a variety of commercial kitchen and janitorial applications. They feature a convenient embossed grip, perfect for dishwashing at your restaurant, diner, bar, or concession stand. Long gloves like these keep your kitchen staff dry when washing dishes and pots in your commercial sink. Each black natural latex glove measures 18" long. This is a really great dishwashing glove. It is much more flexible than the nitril dish washing gloves. It feels like it is just as strong as the nitril. Super durable dish washing gloves. I was having a problem with other tearing. They are pretty big though. I wear XL gloves and these are loose on me. These gloves are great! They are very thick and should hold up well in our very busy restaurant. I have large hands and they fit great. Just received thee gloves and right out of the box they are worth it. These gloves have literally saved my hands . First two washes I felt the difference , not too tight I do have big hands and they run slightly big but they do slide off easily when I must help customers . Highly recommend these gloves . I will be posting a video on the internet about everything that I purchase and feedback from first hand. Have a great day folks . ?????? these gloves are very useful they are up to your elbow and they are pretty thick. We use these when using chemicals so they don't go threw the glove. 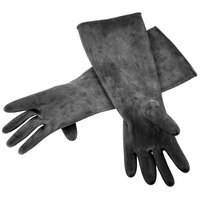 The black natural latex gloves are a great pair of utility gloves perfect for cleaning and handling rough objects. The gloves are well made and a great quality. These are excellent gloves. They hold up under heavy use. Our staff likes wearing them especially when dealing with grease and other heavy duty cleaning. Great gloves, much better performing than the photos do justice. We are really excited to have decided on these and use them for many years. These are our go to gloves for our dishwashing crew. The extra length is great for washing deep pots and keeps hands away from harsh detergents and chemicals. These gloves were the solution to our problem of getting water inside our dish gloves when reaching into a deep sink full of sanitizer solution, and they work great for this! Very happy with this glove, Good for diahwasher. Its long so it will cover all the way up, This gloves a lilttle thicker than other dishwasher gloves. These gloves were intended to be used for dishwashing, however they don't come in sizes. Unfortunately all of our staff has small hands, and they don't fit any of us. If you have large hands, they are great because they are a good thickness. A wonderful pair of black neutral latex gloves that are perfect for cleaning. They help protect my hands and arms from the chemicals used to clean the bathroom. These nice, thick rubber gloves are great for cleaning and dishwashing. Extra long length keeps your forearms and shirt sleeves clean and dry. Thick, yet comfortable to wear. These elbow length black latex gloves are a very thick glove for heavy duty cleaning applications. Protect your hands from harsh chemicals or hot water with these nice thick latex gloves. I'm very happy for this black natural gloves, that is great quality and good price to,this is perfect for me to clean my house, long enough. These work great for about 3 months. And then something punctures one of the fingers and they become useless. It's unfortunate they are just a little bit heavier duty..
Good for cleaning dishes and cleaning filters that use harsh chemicals. These can be used numerous times due to the thickness of the gloves. Great buy! These long black latex gloves are perfect for doing dishes and longer than ones we have previously purchased, preventing water from entering your gloves. Good value and quality!! Great gloves for dish washing or getting use to working with a fryer. New bakers take tune to get use to lowering donuts and this protects them so they don't burn themselves if they splash grease! I purchased this gloves for dishwashing and they work great. They are super long so splatter doesn't reach my arms. They are also good to wear when cleaning the stove. These long latex gloves are perfect for washing dishes, cleaning restaurants or when using harsh chemicals. 18" length keeps your arms dry and protected up to your elbows. Some of our dishwashers love to have gloves on and these are thick enough and exactly what you would expect them to be. Couldn't be happier. These long gloves are great for so many "dirty jobs". We use them when were cleaning out our grease trap. Thick enough to keep the grime off your hands, but not heavy and bulky. Handy to have around. These gloves are awesome. Keeps my hands away from hot water and grime. I could wash dishes all day if I wore these gloves. Recommended. We are using these gloves for 2 years now. We work with lye and these are holding their quality over time even in hard condition. The length is perfect for protect us from harsh chemical and burn while doing our soaps and work as well for the cleaning part of the job. We feel safe and protected and these are a must have for anyone who wants long lasting quality for cheap price. Thought we'd give these a try. It helps that they are longer then the usual. When our dishwasher needs to reach stuff from the bottom of the sink, he doesn't fill up the gloves with water. Very good quality gloves. the only problem is with the size they are too big for M size people. Loved the extra long length. These gloves worked well and hold up to our use for cleaning in the kitchen. Also a good price to buy extras for rotation as needed. Very very good quality gloves. Very durable and had no problems with them at all. I would definitely buy them again sometime in the future. Hands are very sensitive to harsh chemicals. Bought these gloves so to prevent chemical and hot water burns. Good product keeps hand safe and prevents injuries. These gloves cover up to the elbow, which is very convenient when I do dishes in a water filled sink. The gloves are very durable and strong. We use these gloves for cleaning out those not-so-nice areas around the business. They can be rinsed and used many time over and still they don't crack. They work well, little to small for regular use but for the most part they get the job done. Dish wagers will be happy you got them for sure! Perfect gloves for cleaning and protection. OUr brewmaster loves these gloves and they have protected him from the crazy cleaning chemicals he uses. We love the product. these are great our kitchen guys like them alot. And they cover to the elbow. definetly will buy more and do recomend these to anyone. These gloves are great for lots of dishes! Great 1 size fits all!! Nice for cleaning grease traps and even heavy duty rubber kitchen mats!! Gloves are of good quality and work well for their purpose, the size is universal and the long lengths make it so that water is not able to drip inside.